Kenny Drew, piano; Paul Chambers, bass; Art Taylor, drums. As has been clear from the start of his career as a name jazzman, Jackie McLean stems less directly from the Bird tradition than his fellow Blue Note alto man Lou Donaldson. There is evidence from time to time of the early impact of Sonny Rollins, with whom he played as a teenager in a neighborhood band in New York, along with Kenny Drew. Whatever the influences, Jackie did not take long to evolve his own voice. It took him a little longer to develop as a writer. This album shows more effectively than any previous release his ability to create somehting more than casual unison-line frameworks. Two new compositions by Jackie and one by Tina Brooks feature a front line that is three men strong. "This was a challenge for me, because I didn't have much musical education and most of what I know about writing I found out for myself." "Appointment In Ghana" leads from a slow introduction into a harmonically intriguing fast theme. Blue Mitchell's solo, though not strikingly different from Donald Byrd, seems to reflect a little more of Clifford Brown in his sound. Tina Brooks, who can make even a series of straight quarter notes swing (as he does at one point in his solo here), is a Rollins-Mobley product who has been finding his own path, as his LP True Blue recently made clear. Tina was also a major contributor as a sideman on such dates as Jimmy Smith's The Sermon. "A Ballad For Doll" was named for Jackie's wife Dolly. Here you can observe Jackie's keenly developed faculty for blending a good melodic line with an attractive harmonic undercurrent. Kenny Drew's solo, mainly chordal in concept, contrasts interestingly with the horn-like work of Sonny Clark. "Isle Of Java" is a slightly exotic opus that cooks from the first beat and is characterized chiefly by its whole-tone, double-augmented basis. The line itself is simple while the chord structure gives the work its personality. Tina's opening phrase is a deliberately humorous quote; the rest of his solo is full-blooded, passionate and immensely assured. Kenny Drew's driving, technically impresive solo follows; then, after Kenny has chorded gently behind a fleet Paul Chambers' solo, the theme returns. Everyone distinguishes himself on this compelling final performance, but first and foremost, of course, is Jackie himself. Both in his solo and leading the ensembles, he reminds us of the razor sharp sound, the acute sense of time and the passionate sincerity that have come to be known unmistakably in the past couple of years as the most ingratiating ingrediants in Jackie's bag. This is one of a few Blue Note albums which were split sessions. In most cases, a full album was recorded at each session, but much of the material did not meet Blue Note standards. Such was the case with Jackie McLean's first date on January 18, 1959, where his stellar quintet created three magnificent performances and little else. He recorded three more albums which were promptly issued in full. Then in September of 1960, he recorded his fifth with Tina Brooks as a co-leader. Producer Alfred Lion elected to pick the three best performances from this session to complete the releasable music that Jackie had made on his very first date. A fourth tune "Street Singer" was scheduled for release on Tina Brooks' Back To The Tracks, which never came out at the time. 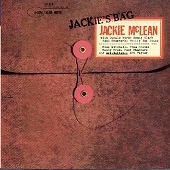 Now Jackie's Bag is available here with all six tunes from the latter session, all of which were briefly issued in Japan (GFX 3067) in the late seventies.